Last Saturday at Cheltenham the five year old Caid Du Berlais trained by Paul Nicholls took the honours in the Paddy Power Gold Cup at their popular three day Open meeting. The race was first run back in 1960 under its original name, the Mackeson Gold Cup when race sponsorship was in its infancy. Mackeson continued to support the 2 mile 4 furlong handicap chase at the Prestbury Park course until 1995. Amongst its famous winners was the Fred Rimell trained bay gelding Gay Trip, who triumphed in 1969 and 1971 sandwiching his victory in the 1970 Grand National. The latter was an amazing feat for a horse who favoured shorter distances and failed to win any other chase over 2 ½ miles. Stephen Wallis takes up the story of the Irish bred horse, who became very popular with racegoers during his National Hunt career which began in the 1966/67 season, an affection which was embellished by his regular rider, the charismatic three time Champion jockey Terry Biddlecombe. Gay Trip was born in 1962. He was bred by Mr F.D. Farmer near Naas from the mare Turkish Tourist. His sire Vulgan (1943-1968) is regarded as one of the most influential stallions in National Hunt history and dominated the sires charts throughout the 1960’s and 1970’s. The horse began his career under the care of Dan Moore (1910-1980) at Naas, Ireland. As well as winning one race on the flat, he won two hurdle races, at Gowran Park and Baldoyle, during his opening season of eight races. However, Gay Trip’s story took a new course when businessman Tony Chambers from Worcester asked his good friend Fred Rimell (1913-1981) to find him a decent horse. Ironically, the Master of Kinnersley, as he was known, had been talking to veteran jockey Pat Taaffe in London and said to him he was looking for a nice animal for an owner. Taaffe, who later rode the horse in his famous victory at Liverpool, recommended Gay Trip. After a couple of trips to Ireland, the second with Chambers, the owner purchased the horse and the small compact gelding, who stood only 15.3 hands high, unlike his sire, moved into one of the prominent National Hunt yards of the time in June 1967. Stable jockey Terry Biddlecombe was soon impressed by the Irish import who began schooling outstandingly well at home. Hopes were high for his first run at Newbury on 27 October 1967 in the Halloween Novices Chase, but despite jumping well prior to the water jump he slipped up on landing and fell. There was no mistake a month later in his next outing where, with Andy Turnell on board, he won the Sheffield Novices Chase at Doncaster. Biddlecombe resumed the reins next time out when the horse won at Lingfield Park in a handicap steeplechase over 2 miles by a comfortable three lengths, with another future Grand National winner Specify in third place. Philip Clifford, the Times racing correspondent, remarked in his report that Gay Trip would win many more races for his owner, Mr Tony Chambers, Master of the Croome Hunt. After a further win in a novice chase at Hereford, Rimell’s rising novice headed to the Cheltenham festival, where, after blundering at the second last, he finished 2nd in the Totalisor Champion novice chase, (now the Arkle Chase) behind the leading Irish novice Herring Gull, who later won the 1968 Irish Grand National. Gay Trip had proved himself one of the top novice chasers so after his opening mid October win at Cheltenham over 2 miles he was entered for his first Mackeson Gold Cup on 16 November 1968. The six year old headed the weights at 11st 5Ib’s in a 13 runner field, but punters still fancied Rimell’s rising star who went off as the 4/1 favourite. Rimell in fact was triple handed with Jupiter Boy and Moonduster representing his Midlands yard. Sadly tucked in on the rails after jumping the first three impeccably Gay Trip fell at the next. His first attempt at winning the race was abruptly over although Jupiter Boy took the prize for the Kinnersley yard with Moonduster finishing 3rd whilst Specify was a short head 2nd. Shortly afterwards, prior to a run at Ascot before the year end, the horse injured his hock in his box and was dogged by injury for the rest of the season. The horse was then acid fired in the winter. Twelve months later Gay Trip made his seasonal comeback in the Mackeson. Unlike 1968 he wasn’t top weight with Titus Oats shouldering 11st 13Ib’s whilst he was carrying 11st 5Ib’s. Also in the field of fourteen were last year’s winner Jupiter Boy and the 1966 Champion hurdle winner Salmon Spray then aged 11. Despite his long layoff Gay Trip again jumped immaculately, regularly into his stride after each successful leap, his only challenger proved to be the top weight whose stuffing was knocked out when he hit the second last badly. Rimell’s young star went on to win by two and a half lengths at 8/1. It was a great feat of training by Fred Rimell to win such a major race, after the horse had been off the course for twelve months. To complete Biddlecombe’s day the winning prize was presented by the Queen Mother, whose horse Makaldar had finished 3rd. The 1969/70 season was the most significant of Gay Trip’s career which ended in his ultimate triumph at Liverpool. He appeared in all the major chases after his autumn win at Cheltenham. Firstly, he came 2nd in the Massey Ferguson Gold Cup at the Prestbury Park course where Titus Oats reversed the placings. He was then sent off as the 5/2 favourite for the Boxing Day showpiece race, the King George VI chase at Kempton, but could only finish 4th behind his old rival Titus Oats who beat the legendary Irish horse Flyingbolt by three lengths. Newspaper reports of the day seemed to indicate that Gay Trip did not stay the 3 mile trip. However, Aintree was now very much on the agenda and when the weights were released at the end of end of January the horse was allocated 11st 5Ib’s. But unknown at the time, events on 27 February were to prove extremely significant in the life of the jockey who had originally recommended Gay Trip to Fred Rimell three years earlier. On a quiet racing day at Kempton during Division III of the Ashford Novice’s Hurdle Biddlecombe suffered very serious injuries when his horse King’s Dream went down on his knees in the straight and after he was ejected, the horse proceeded to kneel on him with his full weight. He then ran over Terry as he was trying to regain his footing. Terry was soon coughing up blood in the on course ambulance before he was whisked off to Ashford Hospital where X rays revealed three broken ribs and more worryingly a ruptured kidney. Indeed on the morning after, the specialist had told Biddlecombe that he was lucky to have survived. Whilst Ken White then took over the stable's rides, which included an Aintree preliminary race in the Cheltenham Gold Cup where Gay Trip finished a distant 6th of 12 at (50/1) behind L’Escargot (33/1), Irishman Pat Taaffe was chosen to ride him in the Grand National. Meanwhile White rode Rimell’s other entry, French Excuse (1970 Welsh National winner) who carried the much lighter weight of 10st 2Ib’s. Taaffe, who was universally known as the legendary Arkle’s jockey had won the Aintree spectacular back in 1955 on Quare Times. Only 28 went to post, the smallest field since 1960 with Gay Trip the only horse carrying more than 11st. Favourite was Two Springs with stable companion French Excuse at 100/8, whilst the top weight was 15/1. In mid division on the first circuit only thirteen were left at halfway, eight horses had in fact fallen at the 3rd fence which included the favourite. Gay Trip was in a handy 7th position when they went out into the country for the second circuit with only thirteen runners left and as they approached Becher’s second time he had moved up to 3rd place. The 8 year old bay was relishing the jumping challenge on the good going. Only 8 remained four fences from home with Taaffe in the leading group of three before taking the outright lead at the 2nd last. Gay Trip rapidly pulled away from the others to win by an impressive twenty lengths from Vulture, his half-brother by super sire Vulgan, who was carrying 10 stone. Fred Rimell had won his 3rd Grand National; another was to follow in 1976 with Rag Trade. Terry Biddlecombe prophetic words of 1967 had come true, though sadly without him in the saddle. Gay Trip who had never won a race over 2 and half miles had jumped his way into history whilst the injured stable jockey had watched on television at home. 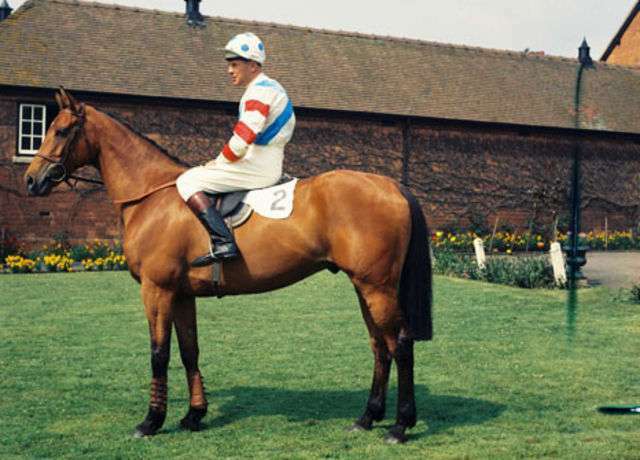 Gay Trip began the 1970/71 National Hunt season with an attempt to retain his Mackeson Gold Cup crown under top weight of 12st 1Ib on 14th November. Roy Edwards took the ride as Biddlecombe was still injured. Disappointingly, the gelding priced at 25/1 slipped on landing two from home when going well, though Rimell had the satisfaction to see his second string Chatham win the race at 33/1. The blonde bomber, Biddlecombe was back on top on New Year’s Day at Sandown where he was beaten in match by Even Keel, but he gave the jockey a great feel. Subsequent trials in the Great Yorkshire Chase (3m 2f) at Doncaster and the Whitbread Trial (3m) at Ascot where he came 5th and 4th indicated that the Aintree Hero was well set for a repeat win with his proven stamina and excellent jumping. However, the horse had been given the top weight of 12st to carry, a 9Ib rise on the previous year. Despite this impediment Biddlecombe, was very confident Gay Trip’s jumping prowess gave him a superb chance, and the jockey felt the horse felt super under him as they cantered down to the start. Yet minutes after the 38 runners had left the starting tape behind them, his confidence had been shattered. Gay Trip the 8/1 favourite jumped the first too big and fell, like four other runners. The race was won by his old adversary Specify at 28/1. Shortly afterwards the horse ran in the Scottish equivalent at Ayr but on the firm going was never going well and was pulled up at the 21st when well beaten. For the third year in a row Gay Trip’s seasonal reappearance came in mid November at Cheltenham in the Mackeson Gold Cup. Rimell had the gelding supremely fit, the ground was to his liking and the old partnership of horse and jockey was at its zenith. Gay Trip gave the field a jumping lesson; he bounded over the fences to win by four lengths to complete his second Mackeson win. It was Rimell’s 4th consecutive win in the race. A 4th place in a strong Massey Ferguson Gold Cup field including the Crisp, The Dikler, Titus Oats and eventual winner Leapfrog from Ireland in early December was followed by runs at Sandown, Wincanton and Windsor. Surprisingly Gay Trip had unseated Terry at the last fence in the John Bull Chase at Wincanton when six lengths clear. His preliminary race ahead of the National was the Cheltenham Gold Cup where he finished 8th at 35/1 in a 12 runner field. The dual Cheltenham Gold Cup winner L’Escargot went off went of as the favourite for the 1972 Grand National in a 42 runner field whilst Gay Trip was a joint second favourite at 12/1. L’Escargot was knocked over at the 3rd to raise everyone’s hopes whilst Biddlecombe hunted the Aintree veteran round the first circuit. By Becher’s second time he had moved up to 5th and remained in the leading group to jump the final fence in 4th position chasing both Well To Do, General Symons and the previous year’s runner up Black Secret. Unfortunately Gay Trip began to hang badly to the right on the long run in, which lost him valuable ground to the leader Well To Do, as the others weakened. Although he straightened himself at the elbow, Graham Thorner on the leader kept to the rails and despite a valiant effort the 1970 victor failed to get up and lost by two lengths. The concession of 22 Ib’s on soft going had finished him, but it had been a courageous effort. Unlike the practice of today to put away your Grand National star for the season Gay Trip was sent on a summer adventure. He ran twice at Auteuil, France, the second in the French equivalent, the Grand Steeplechase De Pairs over 4 miles where with Stan Mellor taking the ride, (his last ever professional ride before retirement) he pulled up on the second circuit not being suited to the fast pace on firm going. Interestingly Gay Trips last ever race was at Aintree on 28 October 1972, the first autumn racing at the course for seven years in the BP Chase over 2 miles 5 furlongs over the national obstacles. Although jumping soundly he came 3rd of the five runners. Trainer Fred Rimell decided to retire the horse in January 1973 whilst Biddlecombe did so in March 1974 after riding 904 winners in a 16 year career. Gay Trip had won 2 hurdle races and eight chases in a seven season National Hunt career. His top class jumping alongside the effervescent Terry Biddlecombe made them a very popular duo on the jump circuit of the late 1960’s and early 1970’s. Significantly of Fred Rimell’s four Grand National Winners he regarded Gay Trip as the best. Not bad for a horse, who apart from the 1970 Grand National, never won another race over 2 and half miles.